On behalf of the members of the Fire & Rescue Department, it is an honor to welcome you to this Web site. 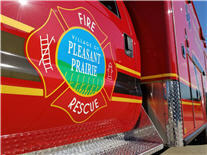 We are pleased that you have taken the time to visit with the Pleasant Prairie Fire & Rescue Department to learn about our department and how to live a safer life. We hope your visit will leave you with the comfort knowing our people are ready to respond. We appreciate the support that the community so generously provides to our organization. Our personnel are trained to provide the highest skilled response to our residents and those visiting our community in a time of need. We continuously strive to improve upon the All-Hazards approach to provide rescue services. accomplishment is the positive attitude and the sheer determination of our personnel who make this Fire & Rescue Department the successful organization that it is. Our commitment is to continue to be a professional, well-prepared All-Hazards organization of Fire, EMS, and Specialized Rescue Services, made possible through the commitment of our team. We continue to work to make the Village a better and safer place in which to live, work, and play. On behalf of our officers, Firemedics & Firefighter/EMTs, We thank you for the privilege of serving you! If we can be of any additional service to you on behalf of the Fire & Rescue Department, please reach out and contact us.